I'd like to add a unique sequential number to bug tracking submissions. How? 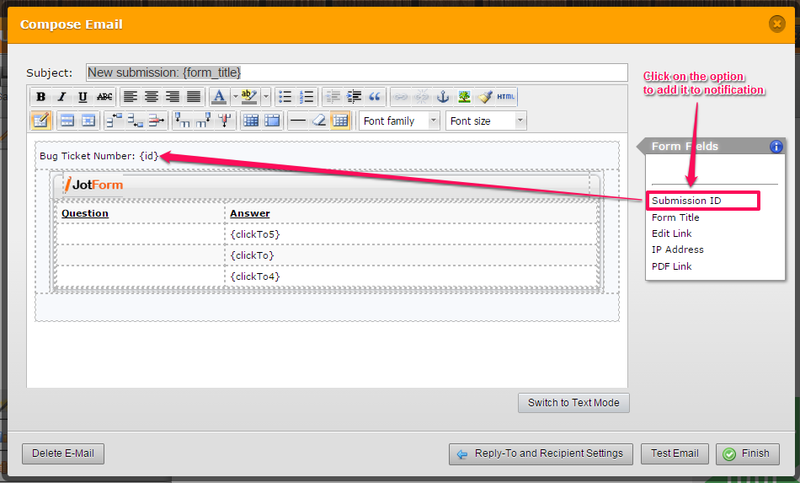 3. display the sequence in a read-only field on the form. I am working on this at the moment. I will provide an update soon. I believe our Submissions Counter Widget along with the Form Calculation widget could assist in this situation. The submission counter widget automatically increments for every submission. You can use the Form Calculation Widget to add the submission count to a higher number (eg 10000000) so that a more realistic ticket number is being developed (10000049). I am currently testing this theory to see if will work. I will provide an update on it soon. I am afraid my suggested resolution provided above did not pan out as planned. Would you like to use the Submission Number instead? This is a number that increments automatically and it cannot be changed. It will not be displayed on the form but it will be generated for every submissions made to the form. You can add this field to your notification email by simply selecting it from the Form Field menu in the notification window. Can this option work for you? Please advise.